If you love to make your own furniture, or make furniture for others, using a Bosch PFS spray system is the easy way to give painted projects a professional finish. I use my Bosch PFS 65 and PFS 55 spray guns on a weekly basis, both for personal and professional painting projects. 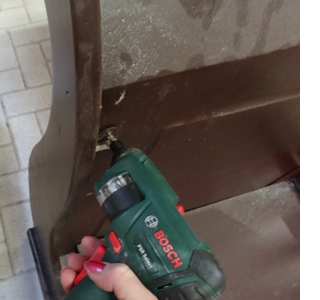 Having recently completed a project for a client, I decided to share some of my painting tips when using a Bosch PFS spray gun. 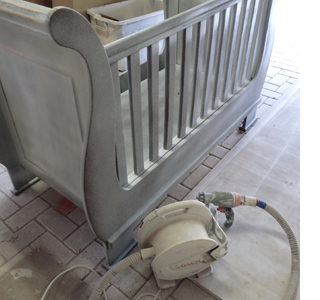 Painting new or previously painted furniture using a Bosch PFS spray gun not only gives your painted furniture a professional finish, it's also the easy way to paint detailed items, such as the cot shown above. 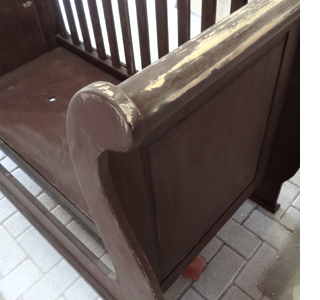 If this cot had to be painted by hand it would take days, whereas a Bosch PFS spray gun can do the job in a couple of hours. 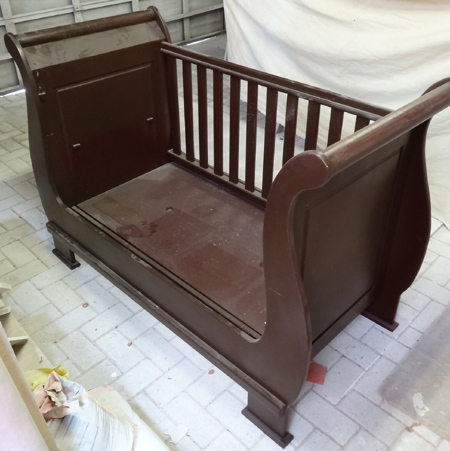 We were asked by a client of Shabby-Chic to turn this cot into a daybed. To do this all that was needed was to remove the adjustable side panel. The cot was still in good condition, barring a few dents and scratches here and there. 1. As with any painting project where you need to paint over a previously painted finish, sanding is necessary. Using 180-grit sandpaper you need to de-gloss the finish (remove the glossy layer of paint) to allow the new paint to bond to the surface. 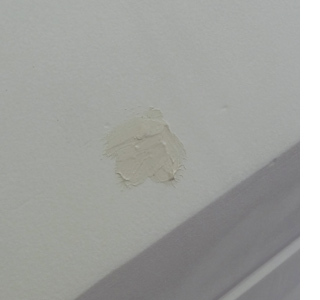 If you skip this step, the paint won't adhere properly and will end up peeling off. 2. Prior to painting you also have the opportunity to fix up any damaged areas. Wood filler is ideal for small cracks and dents, and Alcolin QuikWood is an epoxy-putty that can be used to repair large chips and damage. Once applied, let dry and then sand smooth. 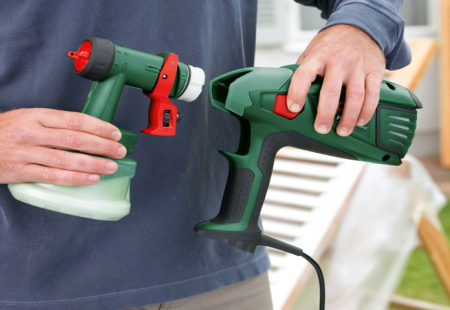 You can use your spray gun - with the paint gun detached - to blow away dust. Have a paintbrush handy to assist with cleaning out cracks and crevices and then blow with the spray gun to clean. When using acrylic paints for painting projects in a spray gun you will need to add water to reduce paint thickness. I normally work on a formula of 20% water to 80% paint. Using an empty paint container, I pour in enough paint for 4 coats and stir in water. There may be times when you encounter lumps in the paint. The easiest way to get rid of lumps in the paint is to pour the paint through a nylon sock when decanting into your paint container for mixing with water. If you don't remove the lumps, these will clog the spray gun. 3. 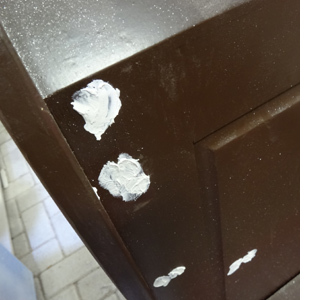 When painting furniture with a Bosch PFS spray gun it is important to layer on coats of paint. I always apply a light, even base coat over the entire project. 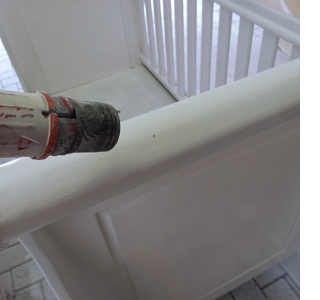 Use the lowest setting on a spray gun for the first coat. Once completely dry you can spray on a second coat. PS. You can see how often I use my spray gun... it's covered in paint! 4. 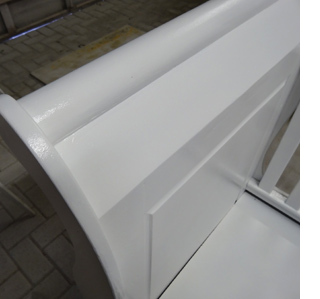 If, after applying the 2nd coat, you still notice a few defects, you can apply more wood filler. Apply a small amount of wood filler, let this dry and then sand smooth with 180-grit sandpaper. I apply 3 coats of Plascon Polvin and lightly sand with 1000-grit sandpaper before applying the final coat. You may think that's a lot of paint, but because you are applying thin coats, a total of 4 coats provides a durable finish to your painted projects. 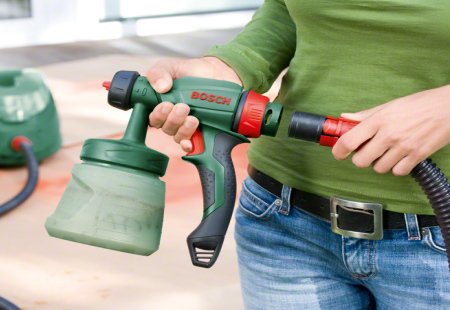 If you have a Bosch PFS 65 or 105E you can speed up the drying process by removing the spray gun and switching on. The warm air from the hose speeds up the drying. 5. Because I use Plascon Polvin for the majority of furniture painting projects, I have the option to apply antique wax or clear acrylic sealer. If you use any paint with a sheen - you can leave out the sealer, but you won't have the option of being able to apply antique wax. 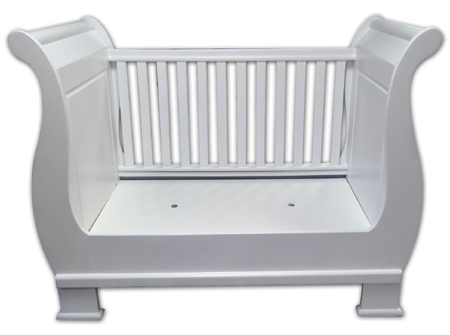 Applying 2 coats of acrylic sealer provides a hard-wearing finish that is easy to clean and is perfect for this cot, bearing in mind that acrylic paint is child-friendly and non-toxic. Although I have both the PFS 65 and PFS 55, I recommend the PFS 65. The latter is heavy to hold for long periods, whereas the PFS 65 is lightweight.